In a large mixing bowl, combine the flour, sugar and salt. In a small bowl, beat together the egg and sour cream. With your fingers, combine the butter into the dry ingredients until it resembles a coarse meal (it should be crumbly). Rinse your hands and pour the beaten egg and sour cream into the large bowl with the crumbly butter mixture. Mix with a spatula until it comes together into smooth malleable dough. Wrap in plastic wrap and refrigerate for at least an hour. In a large bowl, combine the plums, apricots, pecans, brown sugar, cornstarch, lime juice and five spice powder and mix well. Generously flour your kitchen counter and rolling pin. Roll out the dough about a to 1/4- to 1/8-inch thickness. Cut the dough into rounds about 4-inches in diameter. Repeat the rolling and cutting process with any leftover dough scraps until you have used up all your dough. 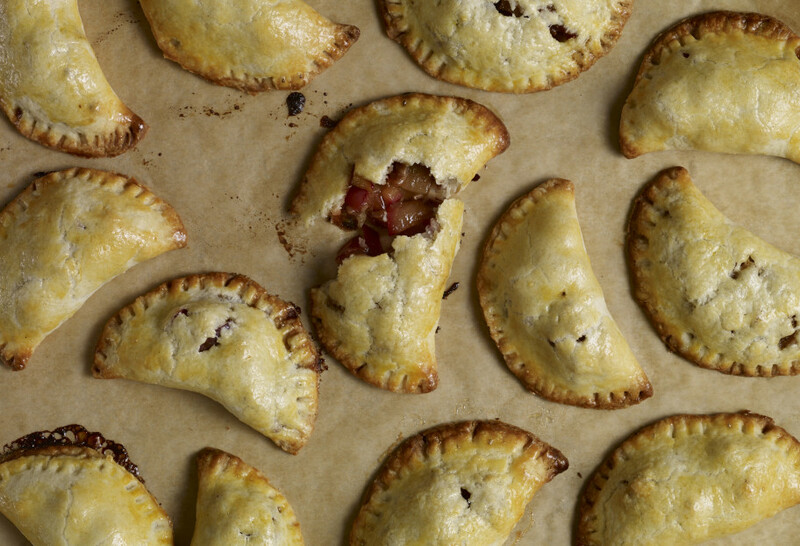 Place a heaping tablespoon of the plum filling in the middle of each circle to make chubby empanadas, brush around the edges with the beaten egg and fold to make a half moon, gently pressing with your fingers to close the edges. Finally, use the back of a fork to seal the dough without breaking it. Line a couple baking sheets with parchment paper and arrange the empanadas on them, as you may need to bake 2 batches or use 2 baking sheets. Brush the tops of the empanadas with the beaten egg and sprinkle with sugar. Bake the empanadas for 20 minutes or until they are golden brown. Serve warm or cooled and, if desired, drizzle with dulce de leche or cajeta. Can you substitute non-fat, low-fat sour cream or yogurt? I love your show; I enjoy it even when I don’t attempt the recipes. I have, however, been searching for an empanada recipe so will try yours. Thanks! Give it a try Olivia, let me know how it goes! Can we make empanadas de calavaza using part of this recipe? I love your shows. You’re the best. My friends and family enjoyed the empanadas. They were delicious. First, I really enjoy your show. Second, my daughter is graduating college in a few weeks and I would like to know if these Empanadas can be frozen, as I do not have the time to prepare them at the time I need them. Thank you for taking your time to respond. Yes you can! Make them and freeze them in a sealed bag with as little air as you can. You may layer them with parchment paper, or plastic wrap, between them. When you are ready to bake them, just bring out of the freezer for about 15 minutes before sticking them in the oven. Que bueno que te gustaron, Ester!